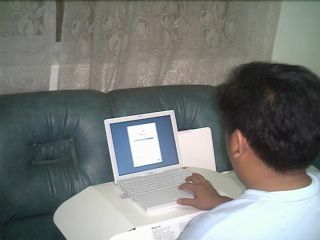 After waiting several months, I finally decided to take the plunge and get an iBook. And I am so happy with it that it kept me busy and hooked for several days! I am still getting acquainted with my new baby. Although I've been hearing and reading about how painful it is to shift from Windows to Mac, I am convinced that nothing could be easier. Yes, the keyboard is different; there's a bitten apple instead of a flying window and the alt and ctrl key are positioned elsewhere. Moreover, the interface is so refreshing. I'll be talking more about this little baby of mine in the next few days. Allow me to bond with it first and like a parent with a new child, I simply just can't get enough of it.